Why Order Personalized Polos from University Fashions? At University Fashions, we provide custom embroidered polo shirts at an affordable price that are specifically designed for both men and women. 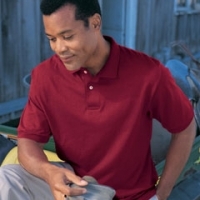 These top quality personalized polo shirts are available in different styles, colors, sizes and fabrics. We offer unisex styles as well as styles that are specifically designed for men and specifically designed for women. 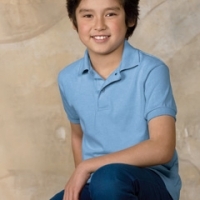 Some of the custom polo shirt features include: striped polo shirts, polo shirts with trim on collar and sleeves, polo shirts with a pocket, and long sleeve polos. We also have plenty plain basic golf shirts in various colors and sizes that will keep you cool and comfortable while on the golf course. You can order the personalized polo shirts with your own custom logo design using our digitizing service or with one of our stock designs. 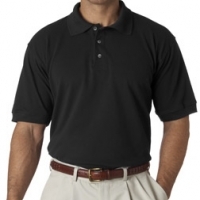 We provide embroidered polo shirts for individuals, organizations and large corporations. 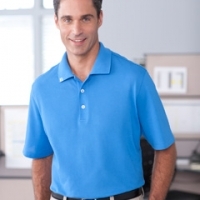 Why Do I need Logo Polo Shirts? 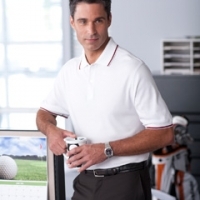 Custom embroidered golf shirts are a great way to advertise your business, and University Fashions enables you to design your own logo polo shirts right online, at extraordinary prices. Standard left chest embroidery designs on custom embroidered golf shirts are FREE. You can personalize top-name golf shirts, in a broad range of colors, with names and logos - all without leaving your home! 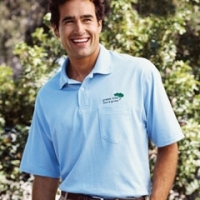 You can quickly create an embroidery design for your polo shirt or golf shirt. Add your own artwork to a polo shirt or create designs using our stock designs and fonts. Our online selection of more than 15,000 embroidery designs means you'll find the exact personalization you want for your polo golf shirts.